This exciting collection of David Goldblatt's essays, available for the first time in one volume, uses the metaphor of ventriloquism to help understand a variety of art world phenomena. It examines how the vocal vacillation between ventriloquist and dummy works within the roles of artist, artwork and audience as a conveyance to the audience of the performer's intentions, emotions and beliefs through a created performative persona. 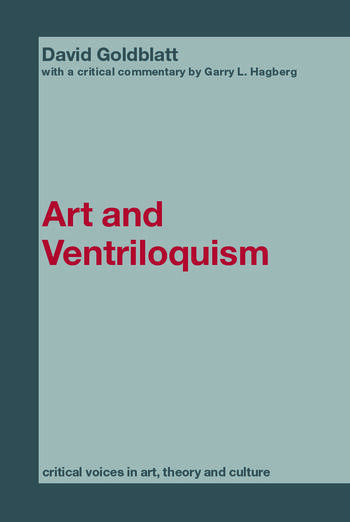 Considering key works, including those of Nietzsche, Foucault, Socrates, Derrida, Cavell and Wittgenstein, Goldblatt examines how the authors use the framework of ventriloquism to construct and negate issues in art and architecture. He ponders 'self-plagiarism'; why the classic philosopher cannot speak for himself, but must voice his thoughts through fictional characters or inanimate objects and works. With a close analysis of two ventriloquist paintings by Jasper Johns and Paul Klee, a critical commentary by Garry L. Hagberg, and preface by series editor Saul Ostrow, Goldblatt's thoroughly fascinating book will be an invaluable asset to students of cultural studies, art, and philosophy.